This is one of my favourite summer dishes, especially when I’m hosting a barbeque for a big party. You can prepare the spicy salad sauce ahead of time, then cook the beef really quickly before putting it all together. You can turn this around in under 10 minutes! Feel free to substitute the beef with grilled chicken, lamb, or even grilled aubergine for a vegetarian version. Preheat a non-stick griddle pan. Alternatively, use the barbeque. Wipe the beef dry and cut into 1-inch thick steaks. Cook over medium-high heat for no more than 2 minutes on each side, or until the meat is cooked to your liking. Slice thinly. Prepare the dressing by coarsely pound garlic and chillies using pestle and mortar or a food processor. Scoop the mixture into a dish and add fish sauce, lime juice, and sugar. Stir until the sugar dissolves (or add a small amount of warm water to speed up the process). 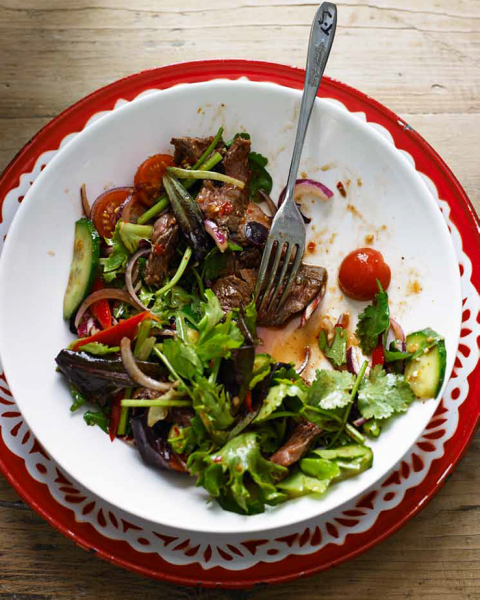 In a mixing bowl, combine the beef, onion, cucumber, tomatoes, spring onion, coriander and Thai parsley. Pour over the dressing and add the salad leaves. Toss to combine. Transfer to a serving bowl and garnish with fresh coriander leaves, sunflower shoots, and baby watercress (or any other leaves you prefer) and serve immediately.